Daily Mirror - Behind a costly door! Believe it or not! 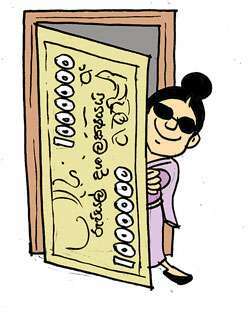 A lady holding a top office in the upcountry health service has got a door worth Rs. 1 million for her office room. When there are complaints galore about the shortage of a variety of items essential for providing a satisfactory health care service to the people, this female high-up has procured every possible facility and comfort for her office room liberally spending the public funds. This female high-up, known to be a close pal of a powerful political authority, has functioned in the present high post so long she seems to have become a permanent fixture here, they say.